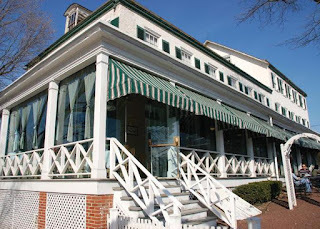 In this Hotel Hell episode, Gordon visits The Brick Hotel in Newtown, Pennsylvania, a historic hotel bought in 2006 by therapist Verindar Kaur and son CJ, in the bid to make a profit they cut corners and there is a high turn over of staff, over 50 members of staff have worked there over 8 months, some only last one shift. Before Gordon goes to the hotel, he meets a large group of ex employees, they believe the turn over is in the 100s and one staff member saw over 50 managers during her time! The staff aren't paid on time and never in full and when they chased payment she called the cops on them. Gordon arrives, the windows on the door are smashed, the wall paper is peeling off and there are bullet holes in the wall. He goes to check into his room and discovers that the clock is caked in years of dust. The housekeeper arrives, there is no programme of cleaning and a bizarre miniature table and chairs. They discuss the hotel and she takes him upstairs to find mouldy shower curtains, carpets, yellow pillow cases, grey and yellow curtains and rubbish in the chest of drawers. Gordon goes to his room, room 201 and finds dust on everything and a stain on the ceiling. Gordon goes down to the restaurant where he meets Tammy who tells Gordon that they are doing 350 events a year to keep the business afloat. Gordon orders the french onion soup, which was tasteless, a cauliflower steak which is a mess and a crab sandwich, straight from a can. Gordon had ordered a burger but he cancels it through fear of his limited pants supply. Verindar blames the staff saying they aren't good enough and denies calling the police on ex staff but a current member in a voice over says she has heard her call the police multiple times. Gordon meets CJ, who is there less than once a month as he works as an IT manager. When they first bought the hotel they were told it was hands off but they are not making money. Verindar is in the kitchen, shouting at the staff and confusing the servers by giving them the wrong food. They tell Gordon they clean the line only and Gordon finds a pot of thick, black grease that is a fire risk. Gordon gets out his bacteria testing kit and tests the vents, they give a reading of 573, a stained chair gives a reading of 446 and the shower curtain gives a rating of 5680! Gordon goes into a room where guests are staying, he shows them mould in the carpet and in the shower. Gordon sets off the fire alarm, evacuates the hotel and closes the hotel. Gordon meets the staff, she blames all staff for the actions of a few bad staff. She accuses the staff of stealing, drinking on the job and sneaking shots from the bar but Gordon steps in to say she must stop blaming them for the past. Gordon meets CJ to make progress with Verindar, he admits she has struggled to adapt culturally and has said she wants to step back. The hotel is renovated over night, with the lobby and the rooms getting a makeover. The menu is also given a makeover that will suit both casual dining and the large functions they hold. For relaunch, locals are invited for a dinner service but also to tour the newly renovated hotel rooms. They love the new food and the kitchen is running smoother. With his presence CJ is able to prevent his mother returning to her old habits. After leaving the hotel, Gordon reports that the reputation was on the mend, CJ is more present which has allowed Verindar to step back allowing the staff to do their jobs and employee turn over is at an all time low. Since Gordon visited the manager has responded to online criticism by saying that a large renovation is planned for the upcoming months. Yelp reviews and Trip Advisor Reviews for the restaurant are mostly negative and some receipts posted on Yelp appear to show some higher than expected prices. As of 2018, the restaurant has new owners and has been renovated and renamed as Rocco's at the Brick, Trip Advisor reviews are mixed. Planning a visit to the hotel? Check out their website for further information. Brick Hotel aired on June 28 2016, the episode was filmed in November 2015 and is Hotel Hell season 3 episode 6. I did find it odd that every single thing is blamed on Verindar - that housekeeper clearly doesn't do her job at all and yet that's someone else's fault? The housekeeper wasn't cleaning! Yes, the owner should make regular checks but at the same time Ramsey (and the staff) said she should back off and trust them to do their work... so which is it? It became pretty apparent that the narrative of the episode was "everything was the owner's fault" when Ramsey was inspecting the rooms and showing the filth to the housekeeper, who's reaction was "oh my god, wow" like... it's YOU who is hired to clean this! Yet Ramsey was like "does the owner ever come in here?" lol weird stuff, I guess they had a single story to tell about the monster owner. Yes I agree about the housekeeper. However there was no mention of how many cleaning staff are on the premises. It's ridiculous to put the blame for dust and grime on one cleaner. The sole blame is bad management. That's down to the owner. The kitchen was disgusting and that's down to not having a kitchen porter or a chef in charge. That again is down to management. The chefs clean their stations, the porter cleans the floors. It's not rocket science. The owner should be grateful for the staff she has as no doubt many took jobs knowing she had a bad reputation. Let's hope she's grabbing the second chance afforded by the programme. I agree it is management who is to blame, there is no way one person can clean all those rooms daily to standard. Furthermore I am sure that the hotel was amazingly dirty when she was hired. With the high turn over rate the housekeeper was mostly there for a few weeks or perhaps a couple of months. The dirt is years old.